"The Preserved Blossom 矜持之花 (jīn chí zhī huā)"
The wife of "The Little Conqueror" Sun Ce 孙策. Da Qiao is a very minor character in the story that has virtually zero air-time. The elder of the "Two Qiao sisters", she is supposedly incredibly beautiful, but a person of few words. She can play the Qin (an ancient stringe instrument) and sing as well as her younger sister, but she seldom openly performs. It is said that she only performs for her love, Sun Ce. 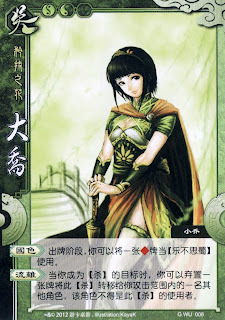 In the story, she became part of Zhuge Liang 诸葛亮's trick to ruse Zhou Yu 周瑜 to war with Cao Cao 曹操, though her effect on him was not as pronounced as that of Xiao Qiao 小乔. Character ability 1: " National Beauty 国色 (guó sè)"
During your action phase, you can use a card with the suit of diamonds as ACEDIA 乐不思蜀. Character ability 2: "Displacement 流离 (liú lí)"
When you become the target of an ATTACK, you can discard an on-hand card to transfer this ATTACK to another player within your attacking range. The receiving player cannot be the same player that used the ATTACK. There is almost no reliable link bridging these abilities to the story line. All we know is Da Qiao is beautiful, so beautiful perhaps that her beauty can mesmerize the enemies into forgetting about the battle? Pure conjecture, of course, and I have not found any direct link. The same with "Displacement". The actual translation for 流离 means to live like a wandering refugee, but there is no mention of her after Sun Ce's death that suggests anything like this. Both “国色” and “流离” come from one of the few sentences that involve the Diao sisters in the Records of Three Kingdoms. They were praised as the “beauties of the nation”, and their complexion was clear as “琉璃(veluriyam, a kind of glasses)”. The mechanisms had no direct links, though.